Just Say Know - Description | W. W. Norton & Company Ltd.
All of our children deserve the chance to be as bright, successful, and healthy as they can be. But our kids are threatened by the wide availability of alcohol and other drugs in our society. Everyone agrees that the best protection is education, but exactly what do you say? 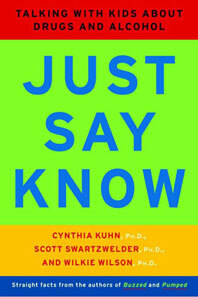 Just Say Know gives parents, educators, and health professionals powerful tools to talk with kids about how alcohol and other drugs interact with their minds and bodies. In a simple, easy-to-read format, it teaches adults what they need to know about a wide range of drugs. For each type of drug the authors suggest conversations that help lead children to choose freedom from drug abuse. For everyone who has a role in the life of children, Just Say Know is an informative guide to teaching kids about staying healthy and making the right decisions when faced with the attractions of drugs and alcohol.